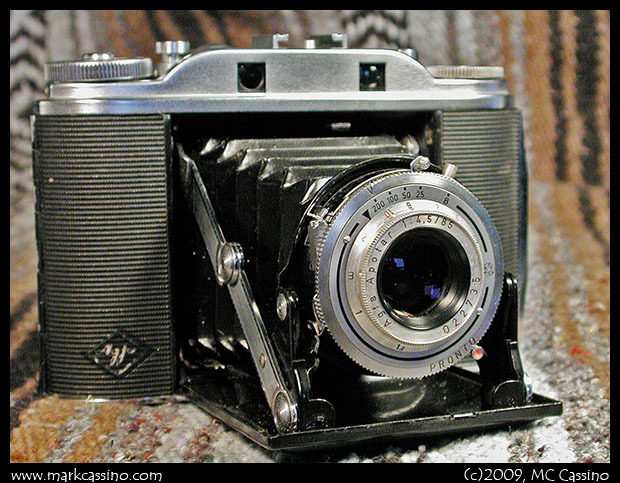 A particular type of camera really caught my fancy – antique (or classic) folding medium format rangefinders. A couple of years ago a friend gave me an old Kodak Retina-A folding rangefinder, and I really fell in love with it. The idea of packing a medium format camera that, once folded up, was only a little larger than the Retina A was just too compelling. Thanks to the Retina A I’m accustomed to zone focusing, so even working with that constraint is acceptable. After a few weeks of searching and researching, a great camera came along on eBay – an Agfa Isolette III. The specimen I bought looked like a beauty. The bellows looked to be pristine (turns out they aren’t) and the lens and camera overall looked very clean (which they are.) The lens focusing mechanism works perfectly. Shortly after the Isolette arrived, I hightailed it the graveyard across the way to see how it worked. 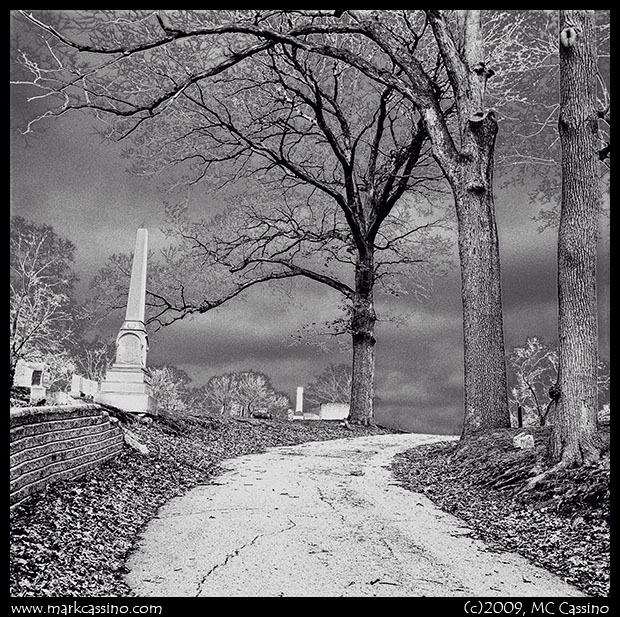 The graveyard is my honored testing ground for new cameras and lenses – the square stones give a good sense of how rectilinear the lens may be, and the rolling hills and trees give abundant opportunity to test a lens under different circumstances. A roll of Agfa APX 400 was used for this test. The first frame was sacrificed to test the bellows – I just advanced the film, opened up the camera, and held it out in the sunlight for a while. After that I just wandered around a bit, and shot whatever seemed interesting. Getting home, I souped the APX 400 in Rodinal 1:50. Pulling the film out of the tank, I was disappointed to see that the first frame was not blank I hoped. Despite appearances, the bellows is indeed fraught with pinhole leaks. I later examined the bellows in a dark closet with a very bright flashlight, and confirmed this myself – the leaks are pinholes, but definitely there. Despite the light leaks, the images I took were not ruined. In fact, the ones where the film was quickly advanced shoe very little impact from the pinhole leaks. Studying these shots reveals a very sharp and contrasty 6 x 6 cm negative – which works for me. So, the camera will have to go off to get re-bellowed. But when it’s refurbished it will be a great addition to my digital camera bag. I’ve tried carrying TLR’s with me, but they take up too much space in the camera bag. The folding rangefinder and a couple of rolls of film will fit comfortably into my digital camera bag, and it will be great to be able to switch over to MF film at any time.